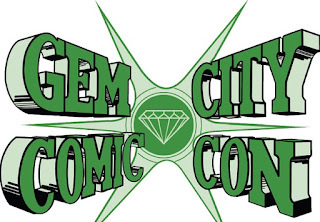 Webcomicography is a weekly article from Champion City Comics that goes behind the scenes of our webcomics to give you the complete story. 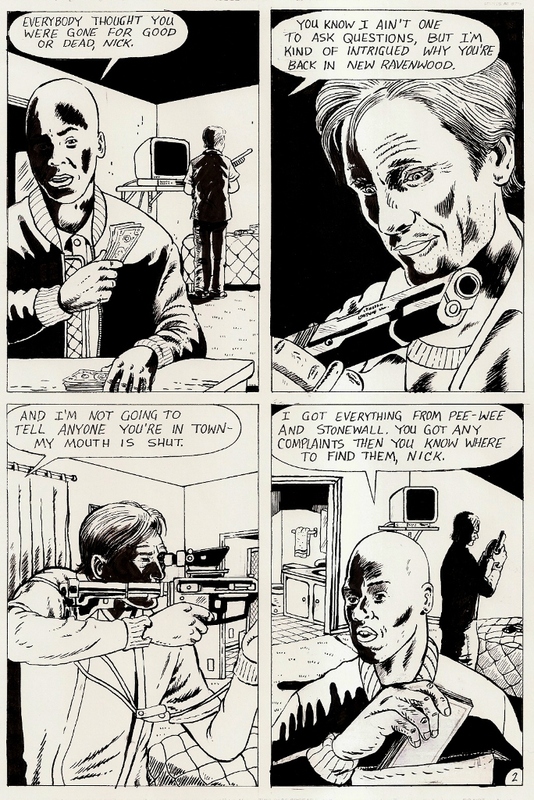 This week we are starting part two of our series for The End of Paradise, a crime noir tale of revenge. Did you miss part one of the story? Click here to read. I had landed A. 'Kav' Kaviraj an artist for The End of Paradise and I sent him ten pages of script. When Iw rote the script, I was watching The Wire on DVD and the dialogue was inspired by the show. 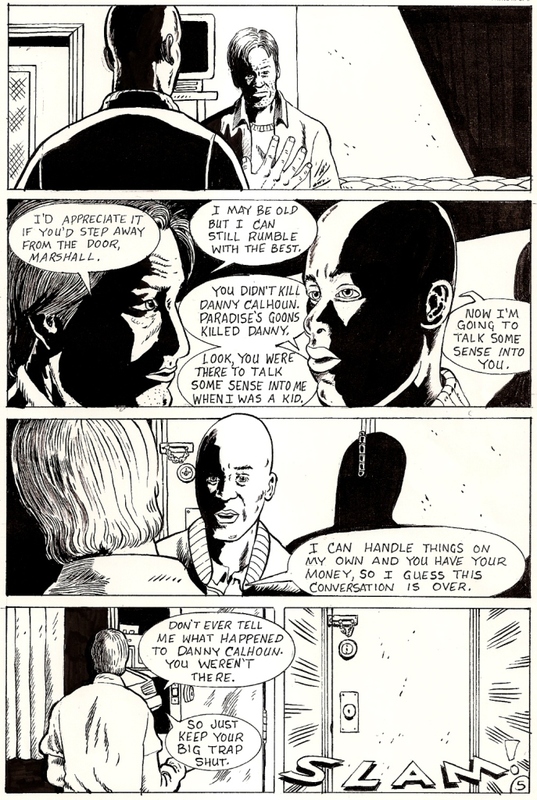 The Wire is my favorite show of all time and I wanted The End of Paradise to have the same excellent dialogue. 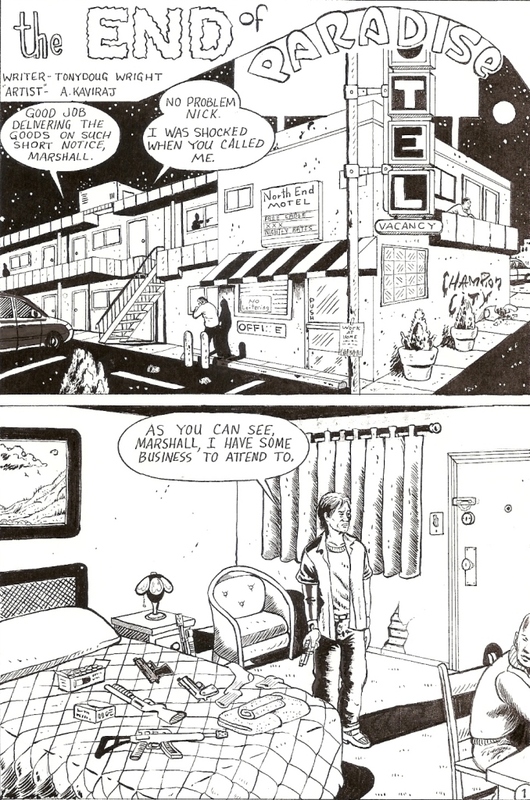 I wanted The End of Paradise to start off in a motel room where the main character, Nick Hamilton, was meeting his weapons dealer, Marshall Jackson. Also at the time, I had just finished re-reading The Great Gatsby by F. Scott Fitzgerald and that is why the lead character's first name is Nick. I tend to use counties and cities as last names for characters. Nick Hamilton is named after Hamilton County in Ohio while Marshall Jackson is named after Marshall, Michigan. I sent Kav the first ten pages of script for The End of Paradise during the end of March of 2010 and awaited the completed pages. Below is the original page one from April of 2010. When I first saw this page, I was slightly worried about the project. 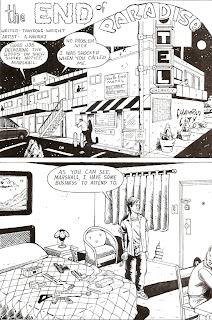 The top panel of the exterior of the motel was fine, but the second panel of the motel room had me a bit concerned. We have Nick Hamilton standing next to a bed that had some pistols and rifles lying on top. Next to him is Marshall Jackson seated at a table. I thought the panel looked really rough and thought the project was possibly doomed. I decided to check the second page to see if I should continue with Kav. The second page is below. There are two versions of page two for you to review. 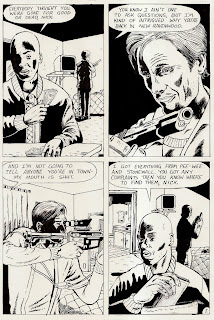 When I first saw the original page two, I was once again sold on Kav as the artist and any questions or doubts went out the window. 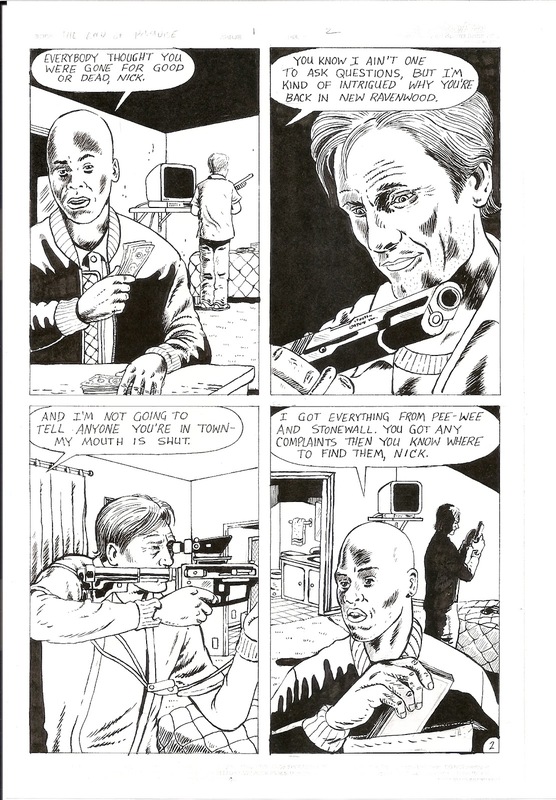 The second panel, where Nick is holding the pistol, had me convinced that Kav was the right guy for this project. 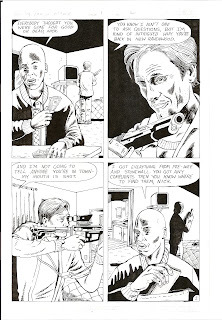 The attention to detail to the pistol in panel two and the rifle in panel three also had me impressed. It wasn't long after Kav sent me the second page that he asked to work on the shading for the characters because he wanted those panels to have a better noir look. The re-shaded page two is the second page for you to review. Kav is always working on improving his art and that dedication to perfection is something that I admire about him. This is why he's the man at Champion City Comics. 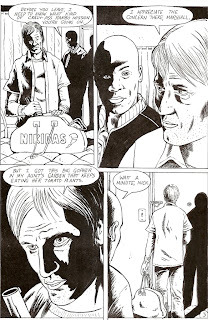 While writing page two, I had to come up with two acquaintances that Marshall could mention while talking to Nick. I came up with Pee Wee and Stonewall. Pee Wee was inspired by The Wire, while Stonewall was the name of some hillbilly kid that lived down the street from me as a kid. Now let us look at page three. I've established Nick has having been AWOL for some time and that he is in need of a bunch of weapons. Marshall knows something is up and wants to know more. Nick decides to throw Marshall a tall tale of a gopher causing trouble in his aunt's garden. I can't recall how I developed that little lie from Nick, but it politely tells Marshall, "None of your business". Here we have a continuation of Marshall trying to get some information from Nick. 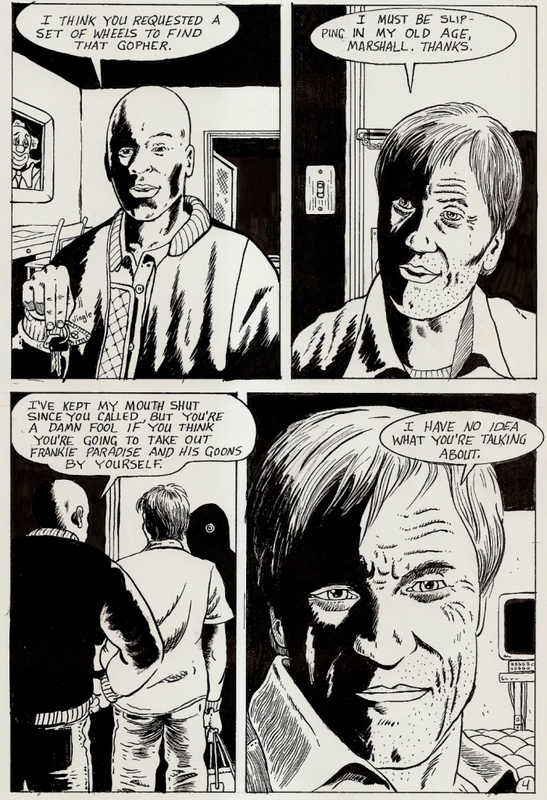 This is the first time we hear the name Frankie Paradise and the tension between the two characters builds and builds. Now we see the motivation behind Nick's mission. Frankie Paradise and goons have killed Nick's friend, Danny Calhoun. There is a tense exchange between Nick and Marshall and the end result is Nick slamming the door. That's all for this week and we will be back next week with more editions of Webcomicography!